Located on beautiful Blue Lagoon Island, our Dolphin Encounter is a magical experience that the whole family will love. Blue Lagoon Island has been converted into a special dolphin center and sanctuary. The goal of this center is to provide a comfortable home for Bahamas dolphins and to provide guests with an educational and hands on experience. The first part of your Blue Lagoon dolphin encounter will include a lecture on the beautiful sea mammals. You will learn all about their behavior, biology, and environments. After this educational lesson, it is time to experience the majestic dolphins for your self. These dolphins are naturally friendly and sociable creatures. They are interested in humans and not afraid to go up to them and greet them. At the Blue Lagoon dolphin encounter, the dolphins are all friendly and especially trained to be able to safely swim with humans of all ages. You will be able to hug them, rub their bellies, and look directly into their eyes. Professional photographs and video are available for you and your group to remember this once in a lifetime experience. Our Bahamas dolphin encounter tours have been running since 1989 and have become a tourist favorite. At Blue Lagoon you will find over three acres of both land and water. You will find various modern facilities on the island including the photo lab, bathrooms, and changing facilities. The area has been featured in various films and TV shows featuring dolphins including the recent Flipper movie. You will never forget the experience of being in the water with such fascinating creatures. 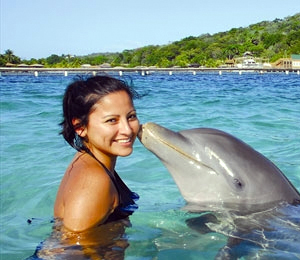 I have been to the Bahamas many times, but Blue Lagoon Dolphin Encounter is one of my favorite trips! It includes everything that everyone should do here. As a Bahamas veteran, I can say only the best about this experience!